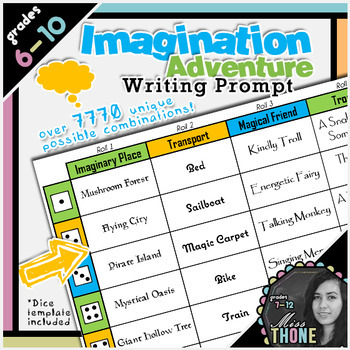 This Imagination Adventure resource will get your students writing creative tales of fantasy lands! With over 7770 unique possible combinations, you could use this year after year and never get tired of the outcomes! Students roll a dice to decide the origins of the imaginary land, the transport used to get there, a magical friend to help them along the way, trouble they may face and something to take home with this handy Roll-A writing prompt resource. Download the PREVIEW to view a demo with student-friendly instructions. Ensure students understand the basics of narrative writing before implementing in the classroom, in addition to the particulars of the fable genre. You could print a copy to add to writing centres, display the color version on the board for a class activity or hand out individual copies to students. Check out my other Roll-A Writing Prompts! The first 10 feedback notes will receive a Roll-A Writing Prompt of their choice FREE. Just email me proof of purchase and the Roll-A Writing Prompt of your choice is yours! Love this product? Think a colleague would too? How about purchasing an additional license? Additional licenses for all of my products are only a third of the original cost.